I hear it. Can you hear it? The unmistakable “back to school buzz” as homeschool moms read blogs, write posts, pose questions and scour the internet for the new year’s resources. In this digital age we are blessed with the ability to find, buy and download curriculum and resources in a moment. and losing files forever when computers crash. Which Mystery of History Downloads Do You Need? Before you have to worry about storing your downloads, you have to choose which downloads you need. Notebooking Pages (4 files) – Learn more about the notebooking pages here. Depending on the ages, interests, and abilities of your children, you may want some or all of the available downloads. Don’t hesitate to adjust the options for each child. Now that you’ve chosen which items you need, you are ready to save and store them. The Mystery of History downloads are a valuable resource. You can use them with each of your children and you can use them again if you choose to cycle back through Mystery of History a second time. In this way, they continue to provide supplemental learning time and time again. Also, you put in the time, effort and hard-earned pay to research, purchase, and implement those materials. So why would you risk losing something so valuable? 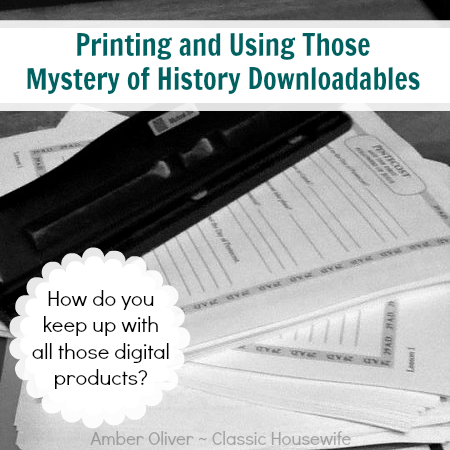 A few simple steps can keep the The Mystery of History digital downlaods ready and available at your fingertips. 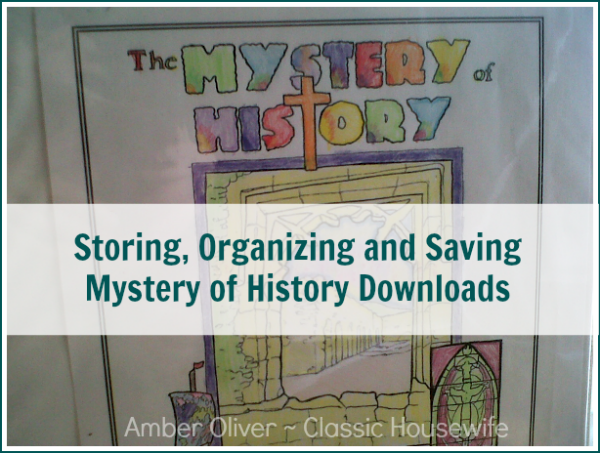 Create a Master Folder – Wherever you keep your school files, create a master folder for all of your The Mystery of History downloads. Sub-Categorize – As you acquire new downloads each year, create new folders for Volume 1, 2, etc. inside of your master folder. Inside each of those, you’ll want to have additional folders for Notebooking Pages or Coloring Pages. This makes it easy to go straight to the item you need. Use an external hard drive – It’s a good habit to regularly back up pictures and files on an external hard drive anyway. But when purchasing digital curriculum, make sure you protect your purchase. Make a CD Back-Up – While it’s not okay to make copies of your files and share them, it is okay to make yourself a back-up disk in case of computer failure. Failures happen. Making a physical back-up is the first thing I recommend when a friend buys the MOH downloads. Now that you’ve saved and stored your online products, how do you tackle getting all those files on to paper? And how do you store them? You have two basic options. Print as you go – If you know you’re on the ball and will be able to prepare on time, you can keep your files on your computer and print out everything you need at the beginning of the week to spread the paper and ink consumption out over the whole year. Likewise, if you know that you won’t use everything and don’t want to print unnecessary papers, you could print what you need as you need it. Print it all out – You might choose to take your disk to a place like Staples and have your files printed (and maybe even bound). Or if you prefer a DIY approach, order a ream of paper and toner cartridge just for the project, and set aside an entire afternoon. Choose the different kinds of files you want to print for each child and decide which pages you want on the back of other pages. Then print it all out, double sided, hole punched, and stored in a binder. If you choose to print and make a binder, you don’t have to reference the computer files very often, and you don’t have to worry about storing the loose papers either. The binder sits on a shelf, almost like a workbook waiting to be filled in. Of course your notebook allows the possibility of adding even more to it as you go through the study. Bright Ideas Press has an added measure of product protection. Despite your best efforts, you may find yourself in a pickle with a lost file. When you purchase digital products from Bright Ideas Press, you have have three chances to download your item within a certain amount of time. If you lose your products fairly soon after purchase, downloading a new copy may be as simple as a login and a click. However, if your time has expired, you may contact Bright Ideas Tech Support for assistance. What other tips do you have for storing and saving your digital products? I’ve got my computer backing up to an offsite storage as well, and that has been a huge help when I’ve lost a few files. I love the suggestion of a special folder. I should try that. Wondering if it will cost less to print out everything at once myself or take my disc to Staples and have them print it all out. I have to print out 2 copies of everything, so my girls will each have their own copy.